Ricky got me this watch.... I am so excited to go running for the first time with it (which I think New Years Eve will be the day since it'll be in the high 50's). But this watch is not only a heart rate monitor, which I love & use for every run already, but this has a GPS on it!!! It will be able to tell me my EXACT distance, & my pace... I'm reading up on everything it can do, but it's going to come in so handy when the racing season starts up. 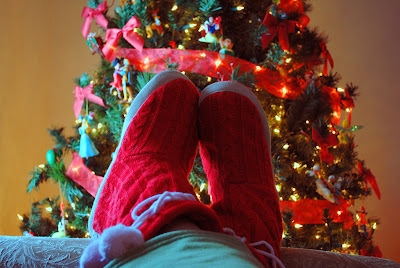 Ricky got me my little snuggy boots because he knows I'm always complaining about how cold I am. If only he got me an extra pair to wear on my hands.... Thank goodness we dont have a cat because they would totally be chasing the fluff-balls hanging off the boots. And then look at this.... I still smile & get giddy when I see it... I think I heard Angels singing when I opened up this box... its my new flash that Ricky got me. It has manual settings on the back & this particular one even has a built in diffuser & shield that pulls out to bounce the light even more. I.am.in.love. Let me tell you, it makes the camera HEAVY though... But it makes the light look super amazing. Did you see the picture of my dad with the twins? Thank you new flash. The BEST gift that I wasnt expecting? Julie had one of these outdoor clothes hanger in her back yard & every time I visit, I've always said how jealous I was of it. I love the smell of outdoor, dried sheets & clothing. So, she totally surprised me with my very own outdoor hanger!!!! I am so excited about Spring time coming when I can get that fresh air in my house!!!! I told her I never knew I could be so excited about laundry supplies!!! I wanted to show you one of the gifts I got Ricky. We were both excited about this. Its called "The Action Bible" & it has all the stories of the Bible in COMIC BOOK FORMAT... its amazing! Really! It is labeled for a child - but I can tell you, both Ricky & I have already sat & read pages & pages of this Bible. If you like comic books, or if you know someone who likes comic books - then this is a must! It already came in handy with the twins... I'll have to tell you that story later. Now its time for a New Year... 2011, here we come!!!! I love seeing what other people got and the thoughts behind them!!! Looks like you had a wonderful Christmas! You got a lot of great things for sure.. I am glad you had a nice time.. Have an amazing New Year.. Happy New Year Beautiful Sister!!! Hahaha I'm cracking myself up right now!!! I totally know that MO is NOT a country!! Hahahahaha how funny. I'm so silly. You really did have a great Christmas!! I too LOVE monogrammed things!! It just seems to make things more girly or something!! My son has a similar Bible but we saw that exact one at Sam's club last week and my husband was eyeing it. It does look pretty cool! It looks like a great Christmas! Oh boy...you are going to love hanging clothes outside! I love my clotheslines! I am so glad you had a great Christmas. I somehow think that no matter what your circumstances, you would make the best of them, though. Love the camera - and the knitting! I just finished, right before Christmas a Tuscany Shawl - which I will be posting about (it took me 18 months - lol). 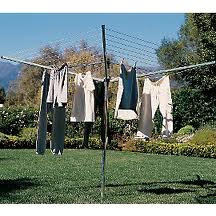 If I had an outdoors clothes line, I would save a FORTUNE in electricity! It sounds like you had an awesome Christmas! May you have a blessed New Year! I am sooo jealous of your flash! You take such great pictures I know you will do even more amazing things! Hope 2011 brings you many blessings and much happiness! Love ya! Big hugs!